At dinner with friends last week, we learned that coho have been seen in one of the local creeks. The next morning — Saturday — we went to our own Haskins Creek to see if the run we’ve watched for more than twenty years had begun. Not that day, though eagles were around, waiting, and the air was redolent with the promise of fish. Nor were they in the creek on Monday. Nor today — though when I walked right to the creek mouth, I saw one leap about ten feet off shore, in the lake itself. It was dark green and red, the colours these fish wear in fresh water, when they’re ready to spawn. And farther off, there was a small group of mergansers, also waiting. 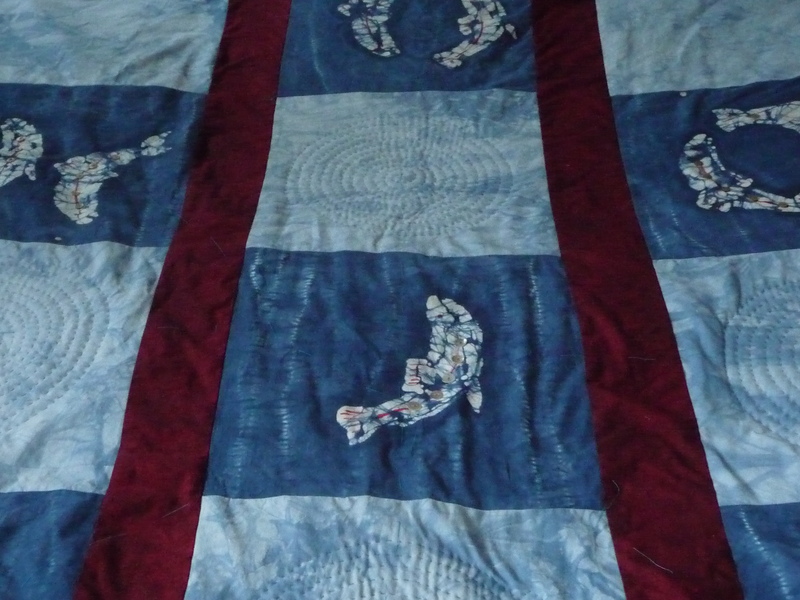 I’ve been quilting this week and have finished half of the light blue squares with their elegant spirals; seven of the indigo squares, printed with salmon, have their buttons. I think the individual elements are coming together nicely. It’s beginning to look more like a quilt than an idea. And working away on it, sewing on the shell buttons which resemble small bright eggs in the bodies of the salmon, I see that the deep red sashing between the squares is like the blood of these fish. Which makes me think that I will quilt small circles in the sashing — the life cycle, from the beginnings (eggs in gravel) to the alevins emerging, the juvenile period in fresh water, the young adults feeding on invertebrates in the ocean itself, their migration back to their home creek where courtship and spawning occurs. ~ by theresakishkan on November 28, 2012. This entry was posted on November 28, 2012 at 11:15 pm and is filed under Uncategorized.You can follow any responses to this entry through the RSS 2.0 feed.You can leave a response, or trackback from your own site.